1. 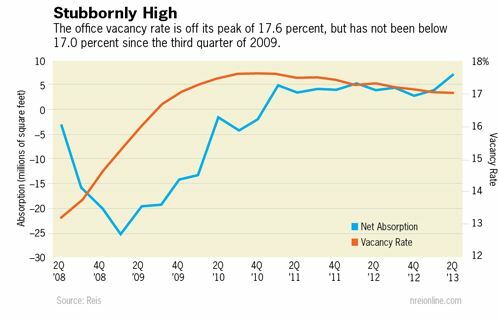 Office vacancies have remained elevated since they peaked in late 2010 at 17.6%. At the end of Q2 2013, vacancies are still 17%. 2. The pace of the office sector’s recovery has been very weak. Vacancies have not been below 17% since Q3 2009. 3. Q2 2013 showed an increase of occupied space of 7.2MM sq. ft. However, this was mostly construction-driven absorption as 7.6MM sq. ft. of new space became available. 4. For the most part, same-store absorption numbers indicate small demand for space in existing buildings. 5. Additionally, the 7.6MM sq. ft. of new space is not a trend. The last time 7MM sq. ft. of new space was added was in Q2 2010. Q1 2013 showed only 2.2MM sq.ft. of new space added. 1. The top 6 metros ranked by effective rent growth in Q2 2013 were San Jose, San Francisco, New York, Seattle, Houston, and Dallas. In these markets, the recovery has been led by Tech and Energy firms. 2. New York and Washington DC were the tightest in terms of vacancy rates – both at 9.7%. 1. Up until September, GDP growth indicated that the economy had performed better than recently thought, but employment figures had been flat. 2. Forecasters were cautious about the remainder of 2013 for the office sector. 3. The Government Shutdown and forthcoming budget discussions may result in even weaker projections for the office sector as office properties are not the primary recipients of new job growth. Excerpts taken from National Real Estate Investor, “Office Vacancies Remain Elevated” September 10,2013; by Brad Doremus is senior analyst, and Victor Calanog is head of research and economics, for New York-based research firm Reis. With the labor market unable to generate significant office-using employment, demand for space remains muted. It is therefore unsurprising that national vacancies have not declined much since they peaked at 17.6 percent in late 2010. Vacancies refused to budge during the second quarter, remaining at 17.0 percent. This is a nominal slowdown from the prior quarter’s 10 basis point decline in vacancy. The pace of the office sector’s recovery has been very weak: on a year-over-year basis, the vacancy rate fell by a scant 30 basis points. National vacancies remain elevated at 450 basis points above the sector’s cyclical low, recorded in the third quarter of 2007 before the recession began that December. Occupied stock increased by 7.2 million sq. ft. in the second quarter, largely driven by 7.6 million sq. ft. of office space that came online. Without this construction-driven absorption, same-store absorption figures indicate that there is little to no demand for space in existing buildings. At this point in the recovery, rental rates are still compressed across new versus existing space; combined with aggressive concession packages tenants will tend to favor new buildings of comparable quality. While comparatively modest by historical standards, having inventory increase by 7.6 million sq. ft. does support the notion of supply growth trending towards a more normal rate. The market has not delivered as much new space since the second quarter of 2010 when many projects were completed only because they had been started before anyone fully grasped the magnitude of the Great Recession. Auspiciously, this quarter’s increase in construction activity comes hot on the heels of last quarter’s 2.2 million sq. ft. of new office space, the lowest quarterly figure for new completions since Reis began publishing quarterly data in 1999. Asking and effective rents both grew by 0.4 percent during the second quarter, the eleventh consecutive quarter with increases. This is about on par with the quarterly average growth rate since rents began rising consistently in the fourth quarter of 2010. Yet, the cumulative growth in asking and effective rents during this eleven-quarter recovery period is only 4.7 percent and 5.4 percent, respectively. For comparison’s sake, the office market is able to produce that kind of rent growth in typical calendar-year periods. Rents remain below peak levels set in 2008. Without stronger GDP growth and more robust figures for job creation, it will take years to return to those levels. Effective rents managed small increases in 70 out of Reis’s top 82 markets; occupancy gains were mixed, with roughly half posting gains and others registering flat or declining performance. This quarter, the top six metros ranked by effective rent growth (San Jose, San Francisco, New York, Seattle, Houston, and Dallas) are all either tech- and energy-markets. Even in New York, long known as the financial capital of the world, the technology companies in “Silicon Alley” in Midtown have led the market’s recovery. This metro-level dynamic reflects the overall economy where the technology and energy sectors continue to be the clear outperformers. New York has tied Washington, D.C. as the tightest market in terms of vacancy rates, coming in at 9.7 percent for the second quarter of 2013. Sequestration has had the most pronounced impact on the Washington, DC area. In fact, D.C.’s vacancy rate actually rose by 20 basis points this period after rising by the same amount in the first quarter. The surrounding suburban areas, which are also strongly tethered to the presence of federal government, showed vacancy increases as well. Suburban Virginia’s vacancy rate increased by 70 basis points during the quarter while Suburban Maryland’s vacancy rate increased by 30 basis points. There is some optimism given the underlying resurgence in the economy that the labor market will perk up following some recent weakness. Second quarter GDP growth was revised up to 2.5 percent, indicating the economy has performed better than recently thought. Additionally, data on manufacturing as well as auto sales points to a more upbeat assessment of the U.S. economy. 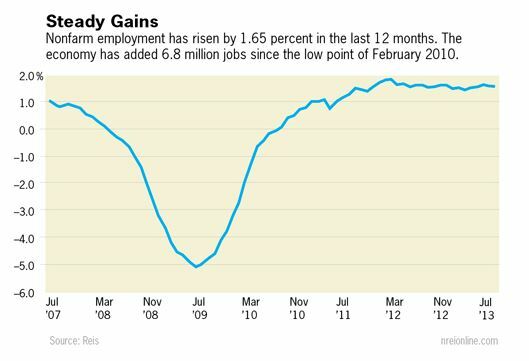 However, employment figures have still been lackluster. August payrolls came in below expectations while downward revisions were made to both June and July figures. In fact, July’s revised payroll increase was the lowest monthly figure since June of last year. Given the mixed bag of economic news, we remain cautious about the remainder of 2013, especially for the office sector. The economy is certainly heading in the right direction, but office properties are not large beneficiaries of the economy’s recent bright spots; namely, the auto and housing sectors. Overall job growth for 2013 is only on pace to match 2012, and office using employment growth is still among the laggards. As such, we expect office vacancies to descend very slowly, ending the year at just below 17.0 percent, and asking and effective rent growth to be below 3 percent.